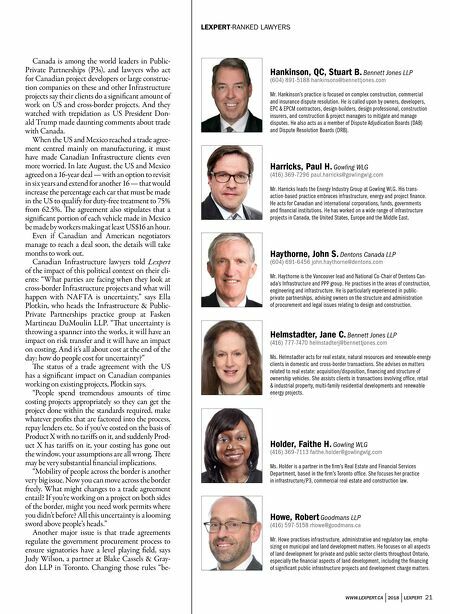 20 LEXPERT | 2018 | WWW.LEXPERT.CA PR ESS TIME FOR THIS ARTICLE WAS SEPT. 4, 2018: e US Government and its agencies, have long had "Buy America" rules. Exceptions were sometimes made, however. Arguably, these rules have been re-energized by trade talks in Washington and the attendant comments by President Donald Trump. Still, when it comes to Infrastructure, Canadian companies and investors are not entirely running away. ere are too many good opportunities to miss without trying, explains Tim Murphy, co-chair of the Infrastructure group at McMillan LLP. "It isn't one market," Mur- phy explains. Clients "look at different regions and ask, would they be more successful in Florida, in Michigan, etc." ey look to the sectors in which there have been successes, wind and solar energy, for instance. And they find a local partner with whom to co-invest and work. "Sometimes it helps to find advisors in the US, ones who can walk through the corridors of power," says Murphy. 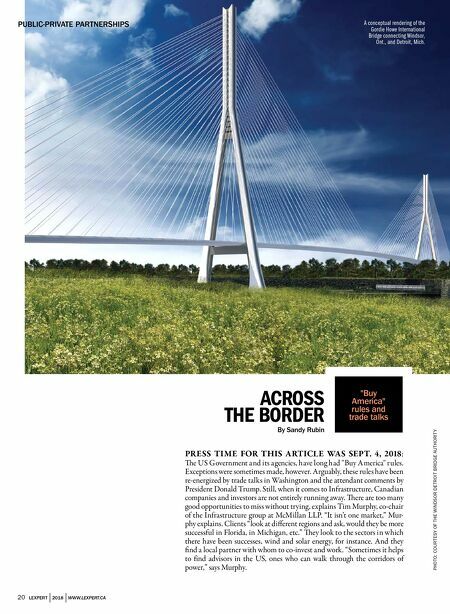 ACROSS THE BORDER By Sandy Rubin "Buy America" rules and trade talks PUBLIC-PRIVATE PARTNERSHIPS PHOTO: COURTESY OF THE WINDSOR DETROIT BRIDGE AUTHORITY A conceptual rendering of the Gordie Howe International Bridge connecting Windsor, Ont., and Detroit, Mich.